CONYERS, GA (WXIA) – Ku Klux Klan flyers were left in the front yards of dozens of Rockdale County families this past weekend, in an attempt to recruit them to join the hate group. The Rockdale County Sheriff's Office is investigating. Rockdale County Sheriff Eric Levett says that largely because of the timing of the appearance of the flyers, his department is taking this very seriously. ROCKDALE COUNTY, Ga. -- Inside the walls of a local funeral home, the grief could be felt and heard. Loved ones said goodbye without understanding why they had to. Flowers lined the room, while mourners lined up to pay their respects one final time. Memories of a man's life flipped on the wall above - memories his family is grasping onto in this most difficult time. 44-year-old Mun Hyuk Cha is the Rockdale County store owner who was senselessly murdered behind the counter of his liquor store last weekend. The man who did it killed another and shot his parents before turning the gun on himself. Cha's family is still begging for answers they may never get. But they invited 11Alive to his memorial service on Saturday. ROCKDALE COUNTY, Ga. -- Autopsy results released Friday reveal the man accused of fatally shooting two people at a Rockdale County liquor store committed suicide. A forensic autopsy performed on 36-year-old Jeffrey Pitts' body showed he died of a self-inflicted gunshot wound to the head. Investigators said Pitts killed a clerk and a customer at Magnet Package Liquor Store at Highway 20 and Bell Road May 31. He then returned home and shot his parents, who were taken to an Atlanta-area hospital in stable condition. Pitts died after exchanging gunfire with a Rockdale County Sheriff's deputy. Dash cam video shows investigators pull up to Pitts' property and approaching the home. At one point, a deputy yells, "Show me your hands!" before shots are fired. A man, presumably Pitts' father, can also be heard saying, "That's my son, he shot me, he shot my wife." CONYERS, Ga. -- Hundreds gathered at the liquor store where two people were gunned down over the weekend. 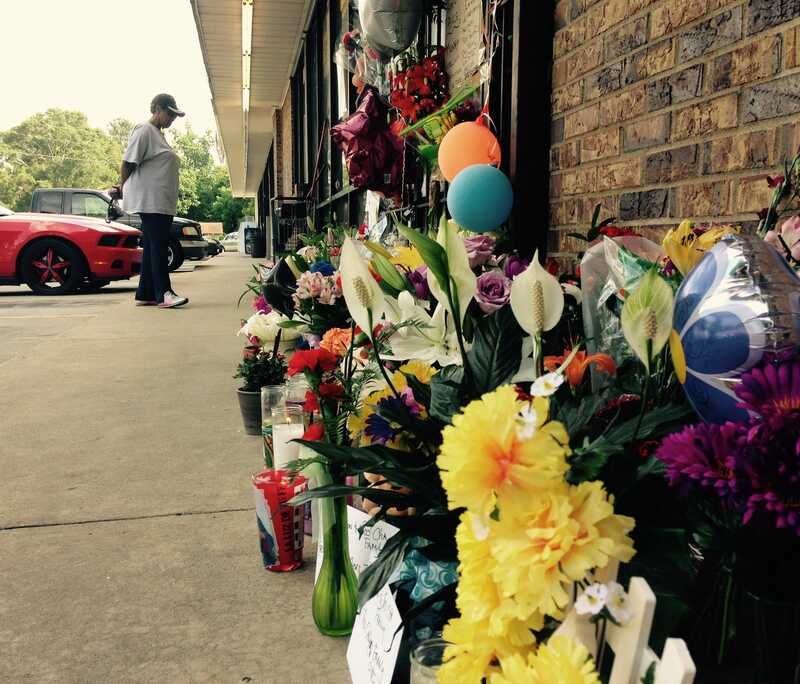 The families of the store clerk and the other victim were visibly grief-stricken. They came by the hundreds, with candles in their hands, tears in their eyes and love in their hearts. They came to pray for the victims in Sunday's rampage shooting at the Magnet Package Store in Rockdale County. They came out to say, "We're sorry it happened, and we share your grief." CONYERS, Ga. (WXIA) -- The GBI says it needs more time to interview officers involved in a fatal shooting – that killed a man accused of a deadly rampage in Rockdale County. Until then, it won't say how many times Jeffrey Pitts was shot, or even whose bullet killed him. Wednesday night at 7 pm, the community is planning to hold a vigil at the Magnet Package store in Conyers for the clerk, Mun Hyuk Cha and Otonicar Aikens, a customer also killed in the shooting. The store on Georgia Highway 20 is already covered in flowers and cards. CONYERS, Ga. -- Authorities say a man shot four people at two different locations before he was fatally shot in Rockdale County on Sunday. According to officials on the scene, it began with an altercation at Magnet Package Liquor Store on Ga. Highway 20 and Bell Road. An altercation apparently occurred after a store clerk took 36-year-old Jeffrey Scott Pitts' identification. Pitts left, but then returned with a large assault rifle. He allegedly opened fire killing a customer, 39-year-old Otonicar Aikens, and shooting the 44-year-old store clerk, who later died. Pitts left after a customer, identified by authorities as Todd Scott, began returning fire. From there, authorities Pitts say returned to his home and shot his parents. Investigators said Pitts fired at deputies and they fired back. Pitts was killed in the exchange of gunfire, officials said. CONYERS, Ga. -- The GBI has been asked to investigate a claim by Rockdale County Magistrate Court Judge Phinia Aten that someone placed a pill in her glass of water while she was out of the courtroom. According to an incident report filed Monday by the Rockdale County Sheriff's Office, the judge had poured a half glass of water during first appearance hearings. Midway through the morning, Aten took a restroom break and left her glass in the courtroom. When she returned, she filled the glass with water from another bottle. That's when, according to the report, "The water started turning very cloudy." The judge looked at the bottom of the glass and noticed a white pill that was disintegrating rapidly. The deputy poured out the water, retrieved the pill from the bottom of the glass and placed it on a paper towel.